Former Manchester United manager Jose Mourinho reportedly feels two club legends conspired against him to get him the sack at Old Trafford this week. The Portuguese tactician’s two-and-a-half-year spell with the Red Devils came to an end on Tuesday morning, with Ole Gunnar Solskjaer being placed in charge until the end of the season. Still, while many will have no doubt seen the Mourinho sack coming for some time after this dreadful start to the season for United, the Special One himself was apparently surprised he wasn’t given more time. This is according to the Metro, who report that the 55-year-old also felt bitter towards the negative atmosphere from outside the club from former players Paul Scholes and Rio Ferdinand. 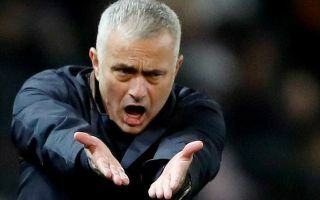 The Metro claim Mourinho feels they conspired against him to get him sacked, despite the fact that he personally felt he did well in his first two seasons in charge. Surely many would dispute that, however, with the quality of football largely poor, and with the team only finishing 6th in the Premier League despite League Cup and Europa League wins in his first year in charge. United may have then gone up to second in the table the following season, but were far behind Manchester City for much of the campaign and lost the FA Cup final with another poor performance against Chelsea.